bread recipe collection. 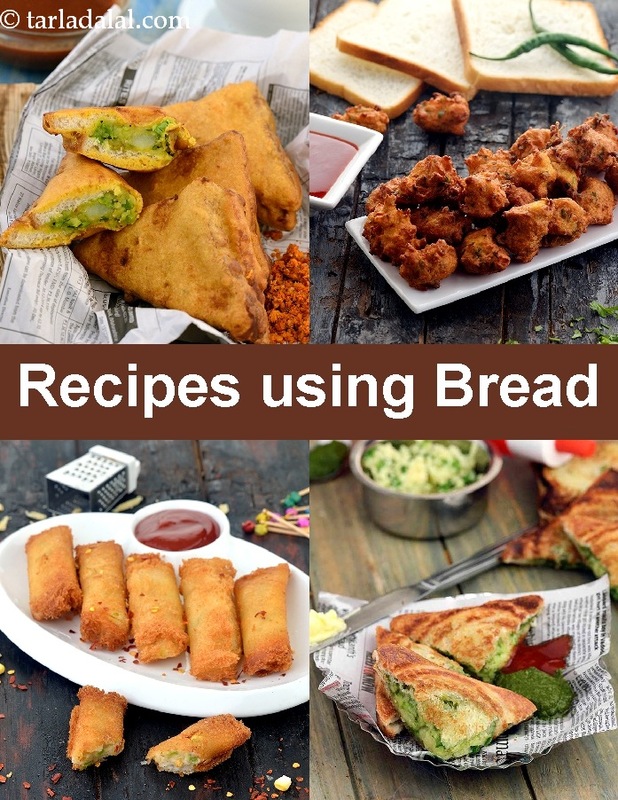 Indian bread recipes. Bread is hands down the most baked product in the world. It is also the most versatile thing to cook! There are so many types of breads available in the world which use different flours, different leavening agents and different ways of making as well. Out of all the breads the most famous and common one is white bread which is usually sold as slices. The basic recipe of this white bread is essentially the same – flour, water, yeast, salt and sugar. The beauty of this ingredient is that it can be used for all types of meals, including to make desserts! Slice bread is a snack in itself, just spread a little butter or cheese on and you're good to go! But just by putting very little effort a simple slice of bread can turn into an amazing snack. Finely chop a few vegetables, mix with grated cheese, put on the bread and you have a great Canape! Pavs are not only to be used for pav bhaji or pav vada, they can be turned into spicy Cheesy Stuffed Piri Piri Pavs. This sauce, originated in Africa, is made of spicy red chillies and really complements the cheese in the recipe. Bread crumbs are made by toasting and grinding the bread into a coarse powder. These crumbs are used as a coating for many tikkis and pakodas and honestly makes the best use of stale, hard bread. A quick and easy snack using these would be Paneer nuggets, all you have to do is marinate the paneer in the masala, coat it with breadcrumbs and deep fry it to get a crunchy exterior. Why go to the trouble of buying extra tart shells when you can easily make some with leftover bread! Make simple Tartlets, stuff it with veggies and proteins of your choice and enjoy! For an innovative snack, break up pieces of bread, flavor it with dahi, chillies and other spices, and make a dough and deep fry to make Bread Fritters to eat with spicy chutney. My most favorite dinner is a hot, spicy street side Vegetable Grilled Sandwich. This sandwich is everyone's favorite for many reasons, one being the nice, toasty bread that gives a nice crunch. Pizza Puffs are a cheat's way to get the taste of pizza without going through the effort. You get the joy of tasting a pizza with the stuffing rolled inside bread and deep fried. Can you even think about bread without thinking of burgers! Vegetable burgers are one of the best things to enjoy on a comfortable night in, making it the best comfort food. Misal pav, a Maharashtrian delicacy of pulses cooked in a spicy masala gravy can only be had with soft pavs. A dish to impress your family and guests is definitely the Bread Kofta Curry with melt in mouth koftas served in a delicious gravy. No meal is complete without dessert right at the end. Desserts made with bread are so much easier (and sometimes even tastier) than their counterparts that you will not go back to the original! Bread Gulab Jamun is one such example! Instead of the usual mawa, we make the jamuns with bread and milk, deep fry them and then add to the sugar syrup! This process is much shorter and easier. Bread Pudding is a British dessert that is flavored with brown sugar, walnuts and raisins and is a must have for those who haven’t tried it yet. If you want to know more about the Uses of Bread, then you can check out our article on that. Enjoy our bread recipe collection. Indian bread recipes given below. Skim milk and corn flour are used as thickening agent to give body and creamy texture to the ice-cream. Brown bread is healthy as is made from whole wheat flour and makes this ice-cream unique delicacy in itself. Mouth-melting bread koftas in delicious pumpkin curry. Easy to make tartlets using bread slices which can be made quickly. Can be served with many different fillings for a wonderful starter or snacks.